Weather – Ministry and Meteorology? The storm was truly remarkable, with a low pressure of 978mb when the storm’s center moved to just southwest of James Bay, which allowed for the hurricane force northwest winds over Lake Superior and rest of the Upper Great Lakes. The hurricane gusts reached into southwest lower Michigan. Those gusts stirred up the ashes in our fire place, which had a set of glass doors on them, and left what looked like ghostly imprints of dancers. 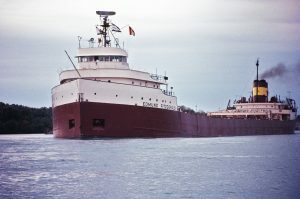 Of course, later we would learn via Harry Reasoner and ABC News (probably WZZM out of GRR as well) that the S/S Edmund Fitzgerald was missing and was eventually found in 530 ft of water north of Whitefish Point. Blogging note** My posterous site is being dumb, so I’m here on my main site for the time being. THE NATIONAL WEATHER SERVICE IN GAYLORD HAS NOW ISSUED A WARNING FOR A DANGEROUS COMBINATION OF HEAVY SNOW AND BLOWING SNOW FROM 7 AM THURSDAY TO 7 PM EST FRIDAY. The area in pink, or whatever shade that is, over the land is where the dangerous winter weather is expected. The blue/gray area is where there is a watch or there is a potential for dangerous winter weather. I’ve looked through the model runs from last night, which is how HPC got this low track. This looks good. In fact, this a bit further south, which means we are more likely in the colder air so that there will be a minimum of rain mixing in with the snow. Winds don’t look like they will get to Blizzard conditions, but it will be blowing enough late Thursday that it won’t matter in some of the more open areas. So for the 12 hours ending at 7pm Thursday (00zFri), here are the snow fall accumulations to be expected. The best snow fall areas will be in the southwest portion of the NWS Gaylord county warning area with the axis of the highest amounts roughly running from Frankfort to Drummond Island. For the 12 hour period (7a-7p), these snow fall totals exceed the warning criteria of 6 inches in 12 hours. This is for 7pm Thursday to 7am Friday, with the axis of the best snow still along the line from Frankfort to Drummond Island. While these totals don’t exceed the warning criteria for 12 hours. when added to the previous map, the 24 hour totals exceed the 24 hour warning criteria of 8 inches. Not to mention that the winds overnight will be blowing about 20 to 30 mph. Of course, let’s not forget our friend, lake effect. It will continue through the weekend. Some areas receive more snow on top of the storm system snow through the weekend. Too early to tell the amounts. However, Friday and Friday night could continue to be significant, as the mid level moisture will be there. Saturday and Sunday, depending on how much moisture is there will determine whether we get light to moderate amounts, or moderate to heavy. Stay tuned. I will be Going to GRR and back on Thursday…I’ll try to get some pictures and do some on the fly blogging if I can. mic stand – gotta boom stand. No sooner did September start that our first cold air outbreak occur and we are getting lake effect rain showers. Droplets were a little hard to see in the picture, but the somewhat lowered visibility can be seen with the break in the clouds. Here’s the radar from the afternoon with the rain band off the lake. Then you see that the main rain has again gone by to the north and the south. This is also the case of Boyne Falls, where I am typing this morning. I know many will say, “But Jeff, look at that mass of rain to the west of you. Surely that will bring some relief?” Well as I have been watching it on the radar the heavier rain has been heading south and the weaker area is beginning to open up. To see how we got into our drought, watch this video below put together by Nick Schwartz (aka Shaggy), a meteorological intern at our office. I can still get come geeking in before work. While this product is formatted for the Wildland Fire Community, it has a good writeup for what's going on. The Hazardous Weather Briefing should be out now. FIRE WEATHER PLANNING FORECAST FOR NORTHERN LOWER MICHIGAN NATIONAL WEATHER SERVICE GAYLORD MI 404 PM EDT MON JUN 6 2011  ...INCREASING HEAT AND HUMIDITY WITH CHANCES OF THUNDERSTORMS THROUGH WEDNESDAY...  .DISCUSSION...A WARM FRONT WILL SLOWLY LIFT NORTH INTO NORTHERN MICHIGAN TONIGHT. THIS FRONT WILL USHER IN INCREASING HEAT AND HUMIDITY THROUGH MIDWEEK...AS WELL AS PROVIDE SEVERAL CHANCES FOR SHOWERS AND THUNDERSTORMS TUESDAY AND WEDNESDAY. WINDS WILL REMAIN LIGHT OUT OF THE SOUTH DURING TUESDAY MORNING...THEN WILL SHIFT TO THE SOUTHWEST IN THE AFTERNOON. LOCALIZED LAKE BREEZES WILL ALSO BE POSSIBLE TUESDAY AFTERNOON AS WELL. SOUTHWEST WINDS ARE EXPECTED TO BE MORE BREEZY ON WEDNESDAY AHEAD OF AN APPROACHING COLD FRONT. THE THREAT FOR PRECIPITATION WILL END ON THURSDAY AS THE COLD FRONT SWEEPS THROUGH THE REGION...USHERING IN COOLER AND DRIER WEATHER BY THE END OF THE WORK WEEK. VALID 061902Z - 062100Z  STORMS MAY DEVELOP OVER THE NEXT HOUR ACROSS WRN UPPER MI AND ADJACENT NRN WI...WITH SOME POTENTIAL FOR DAMAGING WINDS  AND/OR HAIL EVIDENT. WW MAY BE REQUIRED. So we may be under a wach in NW Lower Michigan coming up with the next hour for a good portion of the night. Mary is in town, so if the office did call me to work the event, I couldn’t with no transport. So, it looks like I will be liveblogging anything that happens this evening. CONSIDERABLE CLOUD COVER REMAINING FROM OVERNIGHT CONVECTION WILL CONTINUE TO THIN ACROSS ERN MN/NRN WI INTO THE AFTERNOON ALLOWING STRONG HEATING/DESTABILIZATION TO OCCUR AHEAD OF THE COLD FRONT ACROSS THE EXPANDING WARM SECTOR. THE COMBINATION OF STEEP MID LEVEL LAPSE RATES AND DEWPOINTS RISING TO AROUND 70F WILL LEAD TO MDT/STG INSTABILITY BY MID AFTERNOON WITH MLCAPES TO AOA 3000 J/KG. WITH THE PRONOUNCED EML ACROSS THE AREA...TIMING OF SURFACE INITIATION OF SEVERE THUNDERSTORMS IS A CONCERN AND APPEARS SHOULD BE DELAYED TO MID OR LATE AFTERNOON. LACK OF ANY SUBSTANTIAL UPPER FORCING WITH THE SWLY FLOW WILL LIKELY REQUIRE FULL HEATING TO OVERCOME THE CAPPING NOW IN PLACE. ONCE STORMS FORM...40-50 KT DEEP WSWLY SHEAR AND STEEP MID LVL LAPSE RATES SHOULD SUPPORT SUPERCELLS/SUSTAINED STORMS WITH LARGE HAIL...DMGG WIND...AND POSSIBLY TORNADOES. THE LATTER THREAT SHOULD BE GREATEST IN NRN WI...WHERE LOW LVL SRH SHOULD BE MAXIMIZED IN ZONE OF LOW LCLS NEAR THE WARM FRONT. BY EARLY TONIGHT...EXPECT STORMS TO MERGE INTO ONE OR MCS/S. WIND PROFILES AND THERMODYNAMIC ENVIRONMENT APPEAR FAVORABLE FOR BOWING SEGMENTS WITH AN INCREASING THREAT DMGG WIND IN WI AND POSSIBLY NRN MI. So far, the there are thunderstorms are forming, but no complex as of yet. As you saw previously, in the weather category, I was live blogging the thunderstorms as they came through the region May22nd. Well, we have a better chance a severe weather on June 1st (tomorrow). I won’t be able to live blog it, since I will be working while it is occuring. So keep up with the weather at weather.gov/gaylord. I added the snapshot of our sounding this evening from the office. Did you see the SFC and ML LI? -8c and -6c respectively. If this air mass remains in place over the region for tomorrow, things are just going to go vertical.